Greg is a professional writer living in Calgary, Alberta. His main area of interest is automotive and motorcycle journalism. His work is featured in numerous motorcycle publications, where readers enjoy Greg’s enthusiastic and technical descriptions. Earlier in his career Greg drove new vehicles and produced reviews that appeared in the Calgary Herald’s Driving section and a luxury auto column in Calgary, Inc. magazine. 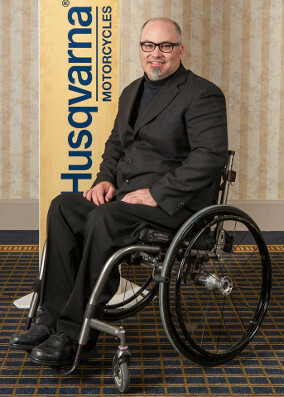 A motorcycle accident in 2004 brought his test driving days to an end, and Greg is now reliant on a high-end titanium wheelchair. Thankfully, that incident failed to dampen Greg’s love for the history and romance of motorcycling. Greg is a prolific writer with his weekly On the Road column appearing in the Calgary Herald’s Driving section. For a decade, he penned a monthly column for Inside Motorcycles called Western Perspectives. Greg now writes the New Old Stock vintage column and miscellaneous feature stories for Cycle Canada, Canada’s longest published motorcycle magazine. Greg’s articles also appear regularly in Motorcycle Classics and monthly in American Iron. Greg also dissects pieces of vintage motorcycle literature and summarizes them in Pulp Non-Fiction, a column in Antique Motorcycle Magazine. October 1996 issue of The Classic Motor Cycle about British motorcycle legend Bernie Nicholson. Publication Prairie Dust, Motorcycles and a Typewriter: The story of Bernie Nicholson and Modern Motorcycle Mechanics. In addition, he has received the Castrol Chinthe Award for Automotive Journalism in 2003 and the Julie Wilkinson Motorsports Award for Excellence in Journalism in 2009. Greg is an avid enthusiast of vintage British motorcycles. He has personally restored a 1946 Velocette MAC 350 and is the proud owner of Bernie Nicholson’s original and unrestored 1939 Triumph Speed Twin which still wears the patina from the years Bernie rode the machine. Greg is a member of the following associations: The Professional Writers Association of Canada, the Automobile Journalist’s Association of Canada, the Canadian Vintage Motorcycle Group, the Antique Motorcycle Club of America and the Velocette Owner’s Club of North America. Greg has traversed North America collecting and documenting vintage motorcycle events. Some of these stories have appeared in a variety of industry publications such as The Classic Motor Cycle, Walneck’s Classic Cycle Trader, Motorcycle Cruiser, Canadian Biker and Motorsport Dealer and Trade. Greg looks forward to providing his readers many more engaging and informative columns.